The SIGNOR 2.0 database is made available under the Attribution-ShareAlike 4.0 International License. 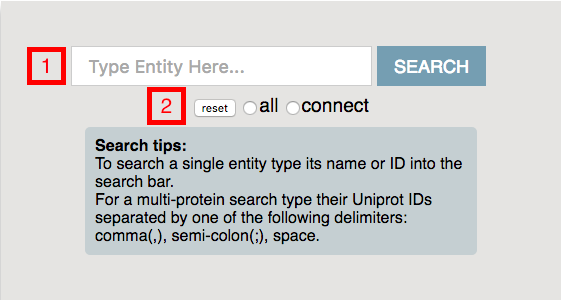 Basic Entity Search: directly type a protein/gene name or other entity identifier and click the search button. This can also be achieved by using the quick-search box in the top menu. 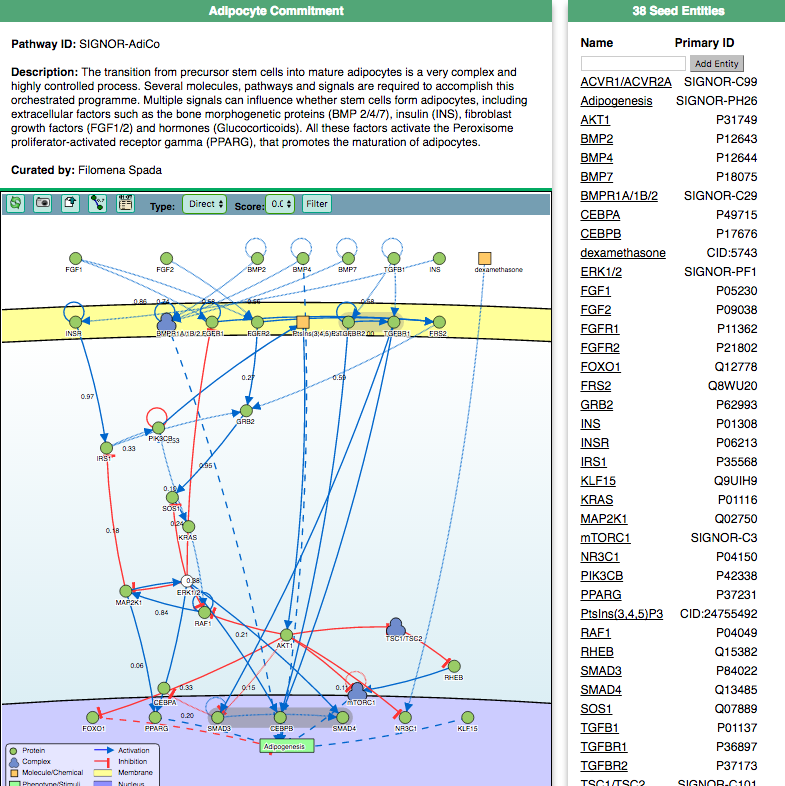 Multi-proteins Search: paste a list of entity identifiers and select "all" to see all the interactors of the listed entities, or "connect" to retrieve a graph displaying only the interactions among the proteins in the list. 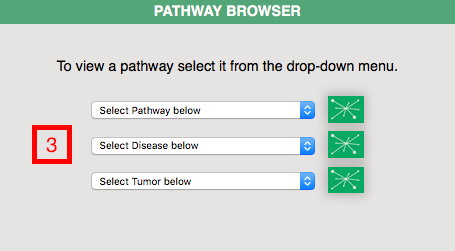 Pathway Browser: select a pathway from any of the dropdown menus and press the button next to it to view information about it and a graph of the interactions that belong to it. Result Selection: when searching for genes, proteins, chemicals etc., the results page displays the list of entities whose names, synonyms or description matches the search term. In case of ambiguity, you are asked to to pick the result you are interested in and click "Get Relation". Preview Box: a preview box is displayed next to the list of results. By hovering on any of the results it is possible to view more detailed information about the entity in order to make the selection more accurate. Entity Page: after searching for an entry or by clicking on an entity in the interactive graph, the Entity Page is loaded. Interactive Graphic Visualization of the selected entity and its interactors. Nodes and edges are clickable. Manually annotated modifications, if any. Including sequence, modifier and other details. Causal relationships listed in a tabular format. Supporting evidence are listed and sample sentences are reported. Extra information about modifications, organisms and links to supporting papers, accessible by pressing the "+" button next to each relation. 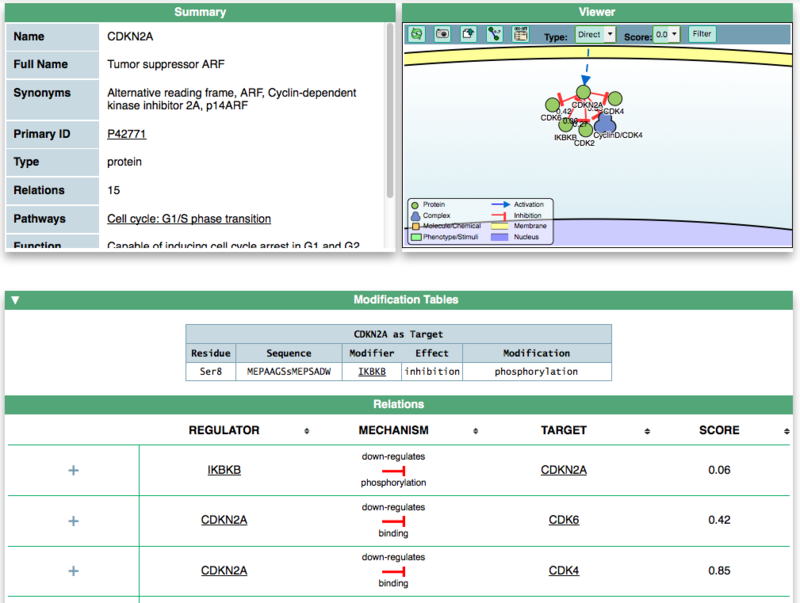 Pathway Page: the pathway shows an interactive display of the biological process selected in the home page dropdown menu or opened through the popup detail window that appears by clicking on entities in the Interactive Graphic Visualizations. Pathways are manually curated and the number of entities considered in each pathway is arbitrarily limited to the ones that are considered central in order to have an interpretable graph. Each edge and entity is clickable to get more information. Entities are automatically laid out and assigned to specific cell compartments (extracellular space, membrane, cytoplasm, nucleus. "Stimuli" and "Phenotypes" are always placed upstream and downstream respectively. A series of filters at the top of the graph frame allow the user to modify the display of the pathway by including or excluding indirect interactions or relationships below a score threshold. It is possible to add entities from the visualization by using the dedicated box and subsequently remove them if so chosen. Through the "Download"; page accessible via the top menu. Through the interactive map by clicking on export on the top toolbar. relation: giving a list of relation identifiers as input. entity: by giving a list of entity identifiers as input and selecting "all" or "connect" to choose whether to download all interactions that involve entities in the list or only those that occur among them.